Customers will be pleased to know that Kathy’s Knits will be open for business as usual during the coming months as roadworks in Broughton street will bring road closures and disruption. Work will commence on upgrading the gas network in the Broughton Street area on Monday and is expected to take around 26 weeks to complete. 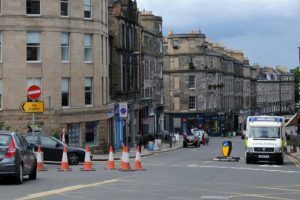 The project will initially centre on Broughton Street between York Place and the London Street roundabout and will mean the closure of northbound traffic for roughly 12 weeks, with parking restrictions put in place for residents. The work will then move to London Street and Forth Street which will involve the closure of Forth Street in two separate sections with diversions and parking restrictions also put in place. Visit to Rhinebeck, the great New York wool and sheep event Broughton Street Lives!